Johannes Fürnkranz from TU Darmstadt will be visiting as a guest lecturer for the course "Inductive Rule Learning". The goal of this course to familiarize the student with fundamental concepts of machine learning in general and inductive rule learning in particular. It will focus both on a predictive setting, where the goal is to learn a set of rules that collectively make a prediction, and a descriptive setting, where the goal is to learn a set of rules that collectively explain the data. 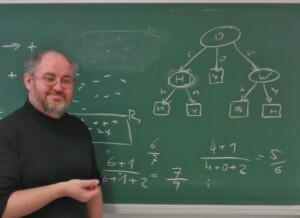 The learning techniques will be first illustrated for concept learning tasks in propositional logic, but later also extended to first-order logic as well as to structured prediction tasks. There are no prerequisites except for basic knowledge about algorithms. The course is thus not only suited for computer science students but for all students that have a strong interest in machine learning in data analysis. Rules - the clearest, most explored and best understood form of knowledge representation - are particularly important for data mining, because they offer the best tradeoff between human and machine understandability. This course will present algorithms for automated rule learning and discovery as investigated in classical machine learning and modern data mining. We will start with algorithms for learning single rules in propositional logic, move on to learning rule sets with the covering or separate-and-conquer algorithm, inductive logic programming algorithms for learning rules in first-order logic, and discuss approaches that allow to make predictions in structured output spaces. Elementary data mining algorithms such as association rule discovery will also be covered, as well as essential concepts of machine learning and data mining. It is thus suitable as a first introduction into these research areas. Most of the course will follow the book "Foundations of Rule Learning" that will appear in Springer-Verlag in early 2012.